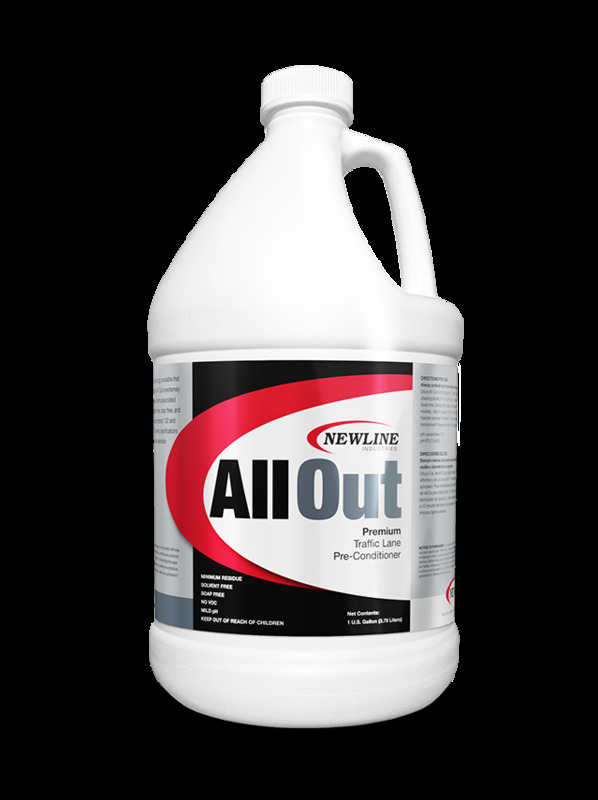 All-Out Pre-Spray allows heavy duty cleaning with a mild pH. It is extremely free rinsing, therefore eliminating problems associated with detergent residue. All-Out is solvent-free, soap-free and free of VOCs. It is extremely concentrated (1:32) and highly cost-effective. All-Out meets specifications for use on stain-resistant carpet and wet, cleanable upholstery and fabrics. In difficult situations try boosting All-Out with: New O2, New Energy, Natural Orange HD and pHire. Use all out on all 5th generation carpets. For pump or electric sprayer use: Dilute 2 - 3 oz. per gallon for light soiling and 4 oz. per gallon for heavy soiling. For injection sprayer use: Dilute 32 oz. per five quarts for light soiling and 48 oz. per five quarts for heavy soiling. Application: Thoroughly wet surface to be cleaned with diluted solution. Allow 5 - 10 minutes of dwell time. Extract.